Let’s start off with Vince’s second favourite image of the day! Mark gets a final quiet moment of reflection before plunging into the day. What a day! Loads of relatives over from Italy, blazing sun and thunderstorms within minutes of each other, loads of noise, hubbub, horses, children, music, dancing, love, lanterns, laughter and happily ever after! 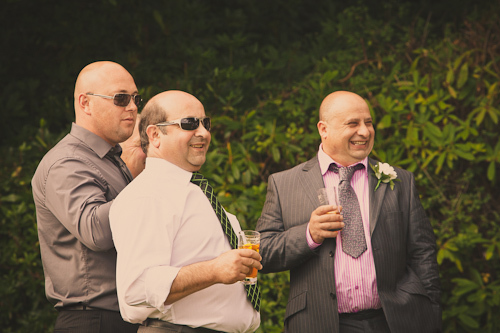 We started out at Castell Malgwyn where Mark and his parents and Best Man were getting ready. Then it was off to Jessica’s parents’ farm where, in spite of dozens of extra people staying in the house and all sorts of hustle and bustle, Jess was ready bang on schedule and ready to greet her adoring public! Then it was back to Newcastle Emlyn, just two minutes from home for us! It was our first time photographing in this beautiful church, and we were kept well entertained by Father Joseph who was nothing short of hilarious! Literally 60 seconds after Jess and Mark walked out of church the heavens opened. And not just ordinary rain but those huge heavy raindrops we are often favoured with here in Wales. 🙂 That kind of unfortunate timing is surprisingly rare in our experience though – the weather almost never has any real effect on your day. This particular little storm did necessitate a brief retreat indoors for the bridal party, but I stuck it out because I think umbrellas can make for great photos! Jess and Mark stuck with their plan of walking up to the castle ruins for some portraits. The image below is my own second favourite of the day! The clouds and the stormy light just sum up the moment, and I adore how the wedding dress still looks gorgeous all bunched up like that! We did have to let them climb in the carriage during another sharp shower but we persevered and got there in the end! Then it was 20 minutes up the road to Rhosygilwen, where it had not rained, and it certainly appeared that a good time was had by all! The wedding breakfast was served in the magnificent Oak Hall. The Best Man thought that Jess and Mark’s big day was just as deserving of kitsch memorabilia as a certain other wedding in the UK this year, and had made t-shirts and mugs for the couple and for all their parents!! After all the emotions of the speeches it was time to relax and get dancing! The Italian tradition is to throw confetti over the couple as they do their first dance. The band Fake Tan came all the way from London, and while they claimed to be intimidated by singing for a Welsh and Italian crowd, the most renowned singers in the world, they were without question the best wedding band we have ever heard!! If you’re looking for a cover band who cannot fail to get everyone dancing and do it hilariously, with loads of energy, and great crowd interaction, this is the band for you. 🙂 We’re seriously considering finding an excuse for a party just so we can hire them. And here’s my absolute favourite of the images I took. Wedding days are so tough on young children, especially if they are in the bridal party, and this little one was a trooper. But at some point enough is enough!! What a beautiful day and night!! Thanks so much to Jess and Mark for the privilege of sharing it with you both. All the images will be available by the end of next week via the Clients link on our wedding photography web site.